The Italian Eugenio Amos (Buggy Two Wheels Drive n°115) pulled off the surprise of the day by winning the 10th stage of the Silk Way Rally in the car class. A stage that Sébastien Loeb (Peugeot 3008DKR n°104) didn’t start this morning after announcing his retirement from the event, following yesterday’s accident. 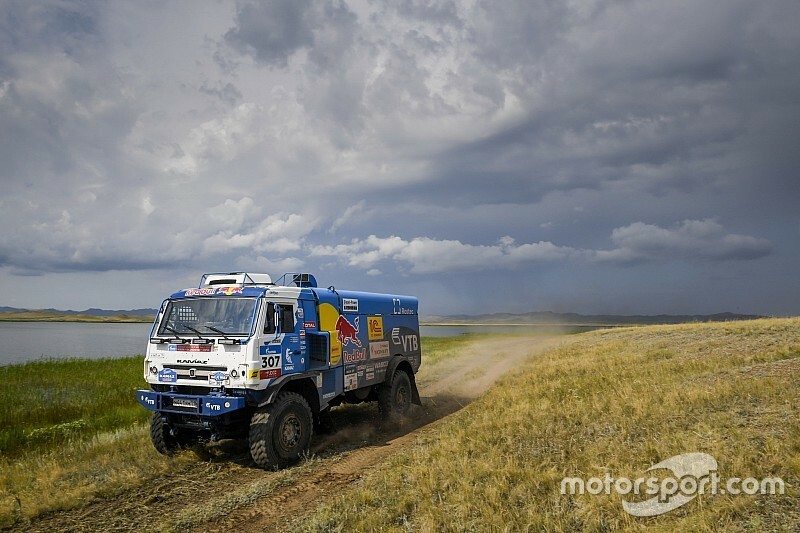 In the trucks, it is Nikolaev (Kamaz-Master n°307) who posts the fastest time after a tough fight with the Tatra Phoenix of the Czech driver Martin Kolomy. Despres gets lost… Amos wins! First on the road this morning, Peterhansel pulled over to wait for Despres, obliging Lu Binglong (Baïcmotor n°130) to open the piste today ahead of the Geeley SMG buggies of his countrymen Liu Kun and Han Wei. Leading at all the timing points up until 40 kms from the end, Cyril Despres (Peugeot 3008DKR n°100) looked like he was about to celebrate taking the overall lead with a second stage victory, until a navigation error cost him precious minutes. Starting just behind him this morning, the Italian Eugenio Amos and his French co-pilot Sébastien Delaunay (Buggy Two Wheels Drive n°115) couldn’t believe their eyes when, towards the end of the special, they saw the two Peugeots emerging from the wrong track and shot past them towards the line… Novice in the discipline, it was with tears streaming down his cheeks that the 30 something ‘gentleman driver’ crossed the finish line to take an unexpected victory at the wheel of the buggy that Carlos Sainz drove in the 2014 Dakar. Behind the Italian the Mini John Cooper Works of Yazeed Al Rajhi and Bryce Menzies completed the day’s podium, just ahead of Despres and Christian Lavieille (Baïcmotor n°107). Sixth on the special but still 2nd overall, Han Wei not only gives away time to Despres, but also to Menzies and Lavieille, who are now only 2m43s and 6m06s respectively overall behind the Chinese driver. Down on sparring partners since coming into China, the Kamaz armada were once again able to count on the Czech Martin Kolomy (Tatra Phoenix n°311) to give them a run for their money. Starting behind the Tatar foursome, Kolomy was leading through on the timing points and getting ready to take his 3rd stage victory when a rear puncture tripped him up on the final sprint. Finishing on the wheel of his Tatra, he was in the end beaten over the line by Eduard Nikolaev (Kamaz-Master n°307). 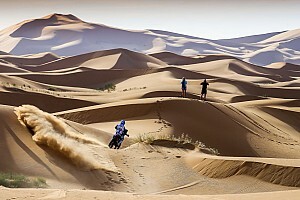 Sotnikov, Shibalov and Mardeev, rounded out the day’s top 5 ahead of the Iveco Powerstar n°310 of the Kazakh Ardavicius. Overall Dmitry Sotnikov (Kamaz-Master n°303) increases slightly his lead over his team mates Shibalov (+15m12s) and Mardeev (+29m48s). Kolomy (4th) remains in contact at 30m30s.